Kat and Karl : destruction that is my apartment. destruction that is my apartment. you can't really tell that it looked like a sixth grade bunking party from this picture. 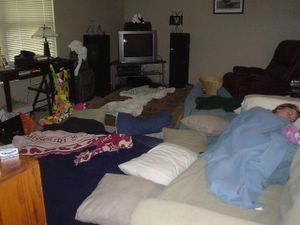 but 10 of us stayed in my little one bedroom apartment saturday night. TEN. females. one bathroom. lots of beer and margaritas and daquaris. too much fun to handle for real.